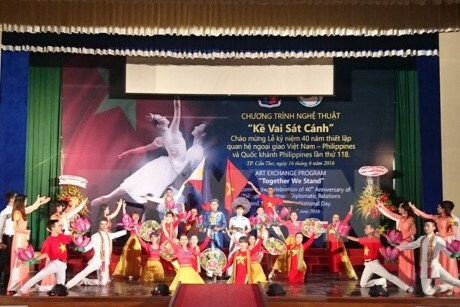 Hanoi (VNA) – The Vietnam Union of Friendship Organisations and the Vietnam-Philippines Friendship Association (VPFA) hosted a meeting in Hanoi on July 12 celebrating the 40th anniversary of bilateral diplomatic ties. Addressing the ceremony, Deputy Minister of Agriculture and Rural Development Vu Van Tam, who is also VPFA Chairman, said since the establishment of bilateral diplomatic ties on July 12, 1976, Vietnam and the Philippines have seen encouraging progresses in the political, economic, cultural, education and tourism areas. Last year, the two countries lifted bilateral ties to the strategic partnership level in order to bring benefits to both nations and contribute to peace, stability and prosperity in the region. The Philippines currently invests in 62 projects in Vietnam, mostly in pharmaceuticals and the food industry. Two-way trade soared to 3 billion USD last year from 416 million USD in 2002. Bilateral cooperation has been expanded across the fields of agriculture, national defence-security, education-training, health care and tourism. Filipino Ambassador Noel Servigon said nearly 30 bilateral agreements have so far been signed since July 12, 1976. In agriculture, the Philippines is a major importer of Vietnamese rice. Moreover, more and more Filipino tourists and teachers have arrived in Vietnam, he said.